COACHBUILD.com - Ever seen a Quadruple Phaeton? Here is a lengthy four door vehicle with no less than four (!!) wind shields. 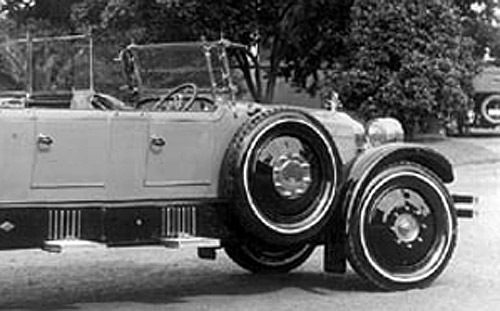 It was made by the Australian coachbuilder Smith & Waddington on the chassis of a White truck. 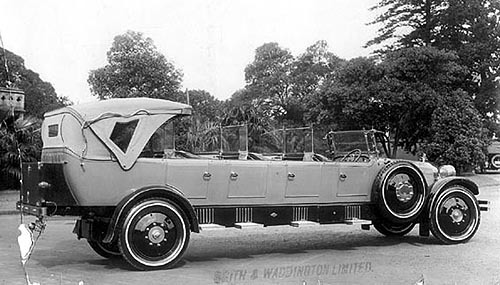 A vehicle with such a coachwork is called "Charabanc". As Wikipedia explains: this type of body was already around before the automobile was invented and was popular at race meetings and for hunting or shooting parties. Initially used by the wealthy, they were later enlarged with more seats for school or works excursions and tourist transport, as a cheaper version of the tourist coach. Forget about all those ugly stretched Hummers and Escalades. Thís is the car to have to gather all your friends and drive up to the fanciest night club! I wouldn't recommend valet parking, though.